What we know about James Alex Fields Jr. 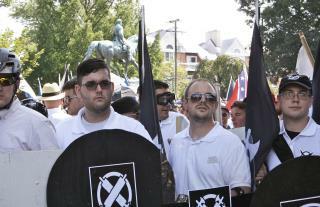 The 20-year-old from Maumee, Ohio, was photographed earlier Saturday with Vanguard America, a white supremacist, neo-Nazi group that the Guardian reports dresses in white polo shirts and khakis. The New York Times reports Vanguard America denied Fields is in any way a member and tweeted that wearing a white shirt does "not denote membership ... The shirts were freely handed out to anyone in attendance." Fields' mother, Samantha Bloom, spoke to the AP Saturday night and said that she was aware her son was headed to Virginia for a rally, but didn't know it was a white supremacist rally. "I thought it had something to do with Trump. Trump's not a white supremacist." She continued, "He had an African-American friend so..." then trailed off. Fields and his mother had recently moved to Ohio from northern Kentucky, and one of his former teachers there recalls his experience with Fields to WPCO. Randall K. Cooper High School history teacher Derek Weimer says Fields "was very infatuated with the Nazis, with Adolf Hitler. He also had a huge military history, especially with German military history and World War II." Bloom told the Toledo Blade her son moved into his own place in Maumee "five or six months ago" but texted her Friday to say he had left his cat at her apartment before heading to Virginia. One of Bloom's neighbors said she hadn't seen Fields' car recently, and says when she previously did see him he often had polka music blaring from the car. The Times cites military records that show Fields enrolled in the Army on Aug. 18, 2015, but "his period of active duty concluded" just shy of four months later; it reports the reason why is unclear. I think mom knew more about what he has been involved in. No one was going to a Trump rally because there were none that day. Maybe she does not own a TV. She can tell that story but she is the only one that believes it. The battle lines are being drawn and the causes documented, and yet both sides seem to want it. When are they ever going to learn to keep their asses out of the streets? Streets are for cars. I'm glad he did it I think I would have done the same thing, When your doing something wrong, you can only blame yourself.